This is a quick, delicious Asian vegetable entrée with some spice. Pair this dish with some Black Forbidden Rice or quinoa for a super healthy meal. 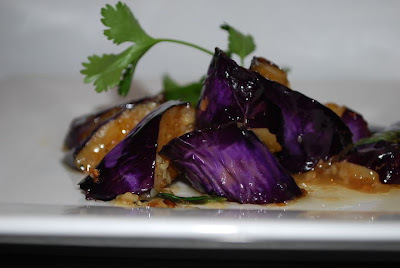 The eggplant also goes well with brown rice or soba noodles. We added a couple of extra garlic cloves because we can never have enough, as well as an extra handful of basil leaves, and grade B maple syrup instead of sugar. Topped on quinoa, this was a great quick and flavorful recipe! Mix fish sauce, soy, water and brown sugar; set aside. Heat wok on medium-high heat. Add 2 tbsp oil, and eggplants. Fry for 2 minutes on either side, or until they begin to brown and turn soft. Remove from wok. Add 1 tbsp oil to wok. Add onions, and fry for 3-4 minutes, or until soft and glossy. Remove from wok. Heat remaining oil. Add garlic and chiles, and fry until fragrant, about 30 seconds. Add sliced pepers and onions; fry for 30 seconds, stirring constantly. Return eggplant to the wok, and toss to combine. Add sauce to the wok, stirring for 1 minute. Toss in basil. Add corn starch, cooking until the sauce becomes thick and coats the vegetables. Serve immediately over hot rice.